To register in the Applicants Register for social housing is the first step to access the Public Housing Stock. Make adjudication and transmission procedures for social housing easier and quicker. Ensure maximum transparency in all procedures. 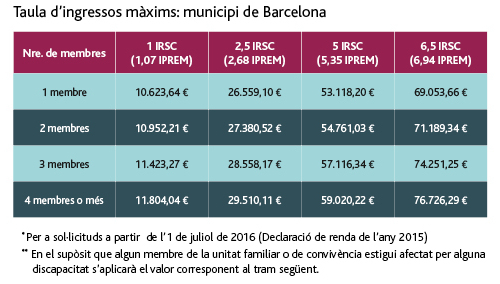 Provide information about the real demand for social housing in Barcelona. 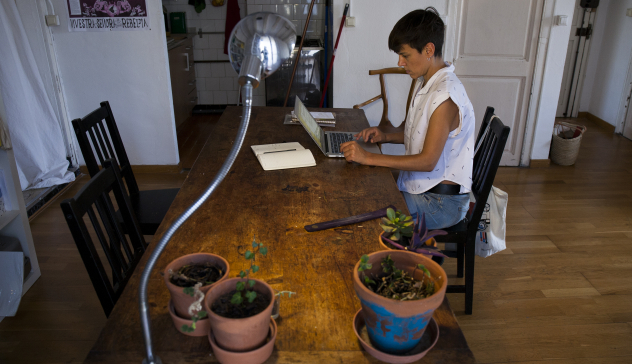 The register, provided for in the Right to Housing Act and developed by the Barcelona Housing Consortium, is of a permanent nature, so that everyone has the means of making a registration application. However, the registration is valid for three years, starting from the administrative acceptance of the registration application. What HPO social housing accommodation is like? What do you need to know before you register in the Applicants Register? These dropdown menus show the general requirements and their relevant specifications. Also the various application and processing procedures. You can register at any time. To be of legal age or a legally emancipated minor. To be a registered Barcelona resident. The person or dwelling unit must be in need of housing, either because they do not have accommodation or because the accommodation they have does not comply with regulations. To earn less than the maximum established levels of income. Not to be in the circumstances of exclusion established in the regulations for the Barcelona Social Housing (HPO) Applicants Register. Not to be in a situation where you are unable to undertake legally binding agreements, in accordance with Catalan Civil Law. For dwelling units consisting of more than one person, this condition is only a requisite for the principal applicant. In the case of a returnee, accreditation for the period of residence outside Catalonia will be required. Applicants may include people undergoing a process of family reunification as members of their dwelling unit, with documentation to confirm this. This has to be carried out before the final adjudication of the accommodation. The person or dwelling unit that applies for registration in the Barcelona Social Housing (HPO) Applicants Register must be in need of accommodation, either because they do not have accommodation or because what they have is not adequate. Applicants are not considered to be in need of housing if the applicant or one of their dwelling unit is the owner of adequate accommodation, with right of use or usufruct. When is accommodation considered to be inadequate? Dwellings that have been condemned under the Urban Development Plan. Dwellings declared to be dilapidated, where there is a demolition agreement. Dwellings that do not meet the minimum habitability conditions established in current regulations, provided that the defects cannot be corrected with construction solutions that do not affect the building's structure. Dwellings which, during annulment, separation, divorce or other similar proceedings, have been legally assigned as the home of the other spouse or partner, provided that the applicant does not have another adequate dwelling, in accordance with register regulations. It will be understood that there is a need for accommodation in cases of abandoning the family home due to mistreatment, where this has been formally reported to the competent authorities. There is no possibility of reasonable adjustment, certified by a report from a Housing Officer. A member of the dwelling unit, with official certification by the competent body, certifies a condition of disability with permanent reduced mobility; or that the dwelling unit includes (o is made up of) people over the age of 65. Dwellings occupied by a number of people that exceeds the maximum occupation limit established by the regulatory policy for minimum habitability conditions. The number of members of the dwelling unit is accredited by means of a census certificate that shows they have all been living at the same address for a minimum of one year before the adjudication process begins. Cases where the owner has initiated a legal foreclosure procedure through the courts or a notary public that may lead to loss of the dwelling. When the applicant proves reasons of work mobility, physical dependence or any other that sufficiently justifies the need for a change of address. The income of a dwelling unit corresponds to the sum of the incomes received by all the people in the dwelling unit. In order to be adjudicated social housing, the dwelling unit cannot exceed the total income limit established in the regulations, for the modality or modalities of dwellings applied for. The calculation is based on the IRPF (Income Tax) Declaration for each of the dwelling unit's members. The presented declaration must correspond to the financial year preceding the presentation of the social-housing application. If one of the members of the dwelling unit does not have to present the declaration, they must present an Income Tax Certificate issued by the Agència General Tributària (Tax Office). That on two occasions, the applicant gives up on or renounces the adjudicated social housing without a reasonable justified cause. During the five years following the date of the revocation or renunciation, the applicant will not be able to reregister. During the adjudication process, it is proven that there is original non-compliance with any of the conditions that made the applicant's registration possible. The applicant will not be able to reregister for a period of five years. That the applicant is the grantee of the sale of an official social housing dwelling. The people or the dwelling unit that are or have been beneficiaries of social housing dwellings may register in order to apply for other types of social housing, once a minimum period of one year has passed since the date on which the rental contract was signed. A photocopy of the applicant's national identity document or foreigner's identification card. A photocopy of the applicant's permanent residence permit, if they are foreigners with permanent residency. If a member of the dwelling unit has a degree of disability above 33%, a disability certificate issued at care centres for the disabled (CAD), or any other document that justifies their right to be included, as a possible applicant, in the special reserve contingents. A document certifying an application for recognition as a returnee, if a member of the dwelling unit is a returned emigrant. Documents certifying income. The applicant must have a copy of their IRPF tax declaration or declarations for the year before the application. If any of the dwelling unit members do not have to present declarations, they will need an Income Tax Certificate issued by the Agència General Tributària (Tax Office). A photocopy of their family register or equivalent document to prove that they live together, in the case that they form a dwelling unit. A court ruling for definitive marital separation or divorce, and the corresponding regulatory agreement when the marital status of the applicant is separated or divorced. Certificate of cadastral titlehold. This document proves the need for housing. For the applicant's convenience, it is not necessary to present this certificate, as it will be sent internally by the Regional Cadastre Office. Original and photocopy of the sales deed for the present dwelling, in cases where a member of the dwelling unit is the owner of a dwelling. Photocopies of property-tax receipts, in cases where a member of the dwelling unit is the owner of a dwelling. A City Council certificate declaring the dwelling to be in ruins, a copy of the regulating agreement, court ruling and formal complaint, in cases where the dwelling needs to be declared in ruins. A formal complaint in cases where there is a need for housing due to abandoning the home because of mistreatment. A photocopy of the complaint and/or court or notary public ruling. Supposition of the beginning of a foreclosure process. The Barcelona Housing Consortium can ask for all the complementary documents it deems necessary, if they are essential for assessing the economic, personal and family circumstances of the applicants. In order to register, the applicant must complete an official application form through one of the established channels. This can be done online, by going to registration application (CAT); or by telephoning the City Council's Information and Processing Office on 010, where you have to follow the required steps and then send off the necessary documents; or by going in person to one of the Barcelona Housing Offices, where you have to make an appointment in advance. Internet: at this link, where you need to enter your application code and password, given when the application was made, using the option Registration Application (CAT). Phone 010: an officer will ask for your application code and NIF/NIE number, and indicate the state of the application process. In person: at any Barcelona Housing Office. You do not need a prior appointment to do so. An officer will ask for your application code and NIF/NIE number, and indicate the state of the application process. Not renewing the application after the three-year validity period is over. At the request of the applicant, with the signatures of all adult members, in the case of a dwelling unit. Being the owner of a social housing dwelling. Non-compliance with the established conditions for registration. Two refusals, without any justified cause, to participate in an adjudication process, and renouncing an adjudicated social-housing dwelling. After the second refusal, it is necessary to wait five years before being able to register again. Revoking registration because of later confirmation of original non-compliance with the registration conditions. After this revocation, it is necessary to wait five years before being able to register again. The dwellings are adjudicated by lot from among all the people on the register, in accordance with the characteristics indicated by the applicants and the requirements established for every draw carried out. See all the information on the adjudication process set out in the Barcelona Social Housing (HPO) Applicants Register.